Great gi and reasonably lightweight about 1.4kg trousers and top. Trousers are very comfortable and feel light. Top is equally comfortable and it feels a bit hard like a judo gi would. Definitely recommend. Well-fitting, good quality & stylish gi. No shrinkage, washes well, no fading. Great product! Buying another one very soon! Great GI, Great Price, Fast Delivery and a free T-Shirt. Will be a returning customer. It's a nice gi. I had to wait a little bit longer for delivery because there was non of my size in stock. 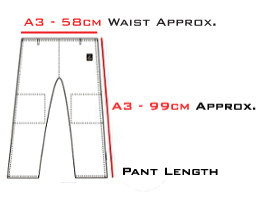 I'm 182cm tall and about 90kg weight.I've ordered jacked and pants A3 size. It's a good cut jacket but sleeves are slightly too long(It will shrink anyway),pants are good lenght but I don't feel comfortably at waist height some reason.Good quality fabric.Light gi. A great range of movment when wear it. I give it 4 stars. The kimono is perfect to fit, beautiful to see and use. It arrived in Italy in few days with no damages. Thank you!